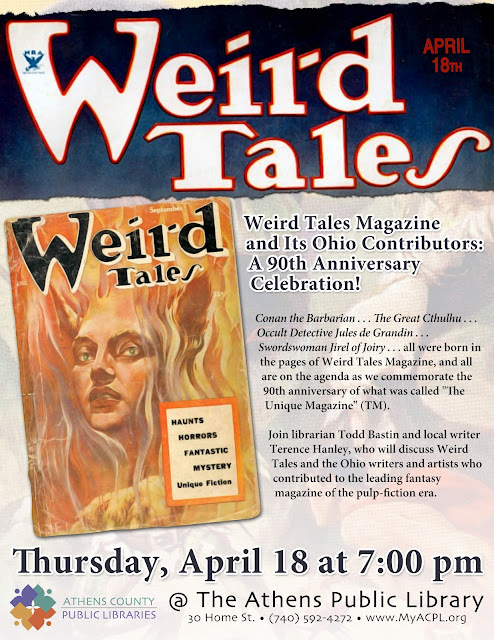 Tonight at the Athens County Library in Athens, Ohio, I will talk about Weird Tales, pulp fiction, and the authors and artists who contributed to "The Unique Magazine." All are welcome and the talk is free. Poster design by Ryan Spellman of the Athens County Public Library. 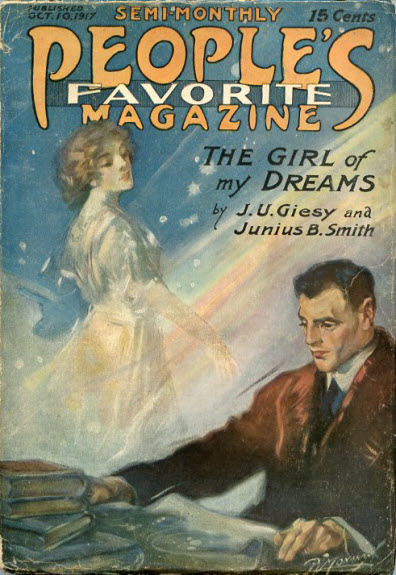 Like Edgar Rice Burroughs (and James Fenimore Cooper before them), Giesy began his literary career after remarking that he could write as well or better than the authors he was reading. 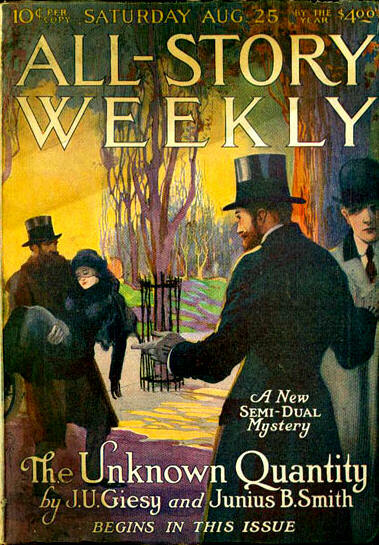 His wife encouraged him to do so, and so he began selling stories to Western Monthly in 1910. 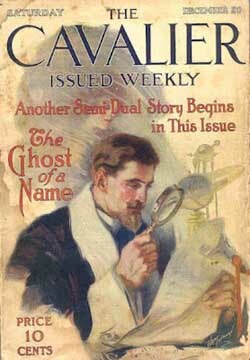 His story "The Occult Detector" appeared in The Cavalier in February 1912. It was the first in a series starring Semi-Dual, an occult detective. It's worth noting that William Hope Hodgson's tales of Carnacki, the Ghost-Finder, are from shortly before that date. Many more Semi-Dual stories followed over the next two decades and were published in The Cavalier, All-Story Weekly, and other magazines. Giesy may or may not have followed the example of William Hope Hodgson in his Semi-Dual series. 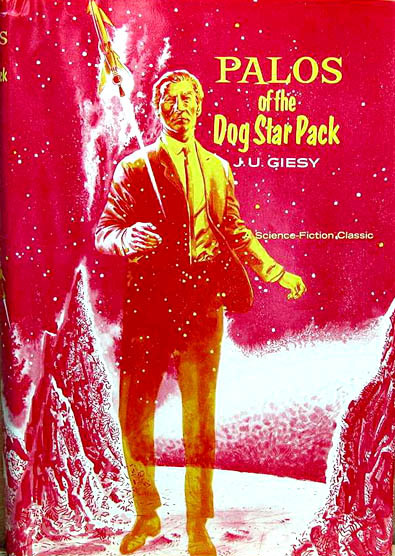 There can be little doubt that Giesy's three interplanetary novels of Jason Croft (All-Story, 1918-1921) were inspired by Edgar Rice Burroughs and his Mars books. 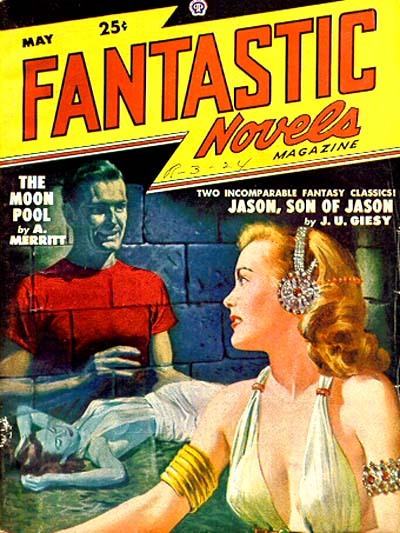 (3) The Jason Croft stories proved popular enough that they were reprinted in Famous Fantastic Mysteries in the 1940s, then by Avalon Books in the 1960s. A third series by J.U. Giesy starred Professor Xenophon Xerxes Zapt and earned Giesy a place on the cover of Weird Tales in October 1925. The title of Giesy's opus is "The Wicked Flea." The cover illustration shows a giant flea chasing a frightened dog. I suppose that was an attempt at humor. Fantasy fans are notoriously serious-minded. I suspect there were a few readers of Weird Tales who objected. I may be a little more forgiving, but it's hard for me to imagine that there wasn't a better subject for the cover of that issue of Weird Tales. Six of J.U. Giesy's stories were committed to film between 1916 and 1921. Chief among those are The Matrimaniac (1916), a comedy starring Douglas Fairbanks, and The Eyes of Mystery (1918), directed by Tod Browning. You can find a full list of Giesy's movie credits at the website of The Internet Movie Database. After a lifetime spent in dual careers, John Ulrich Giesy died on September 8, 1947, in Salt Lake City. He was survived by his wife, Juliet Galena Conwell Giesy (1877-1953), and was buried at Mount Olivet Cemetery in his adopted home city. See the sources cited above. 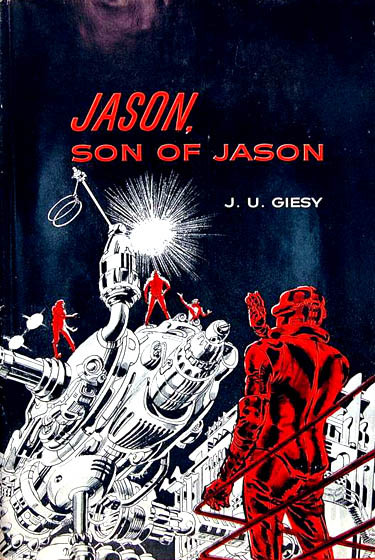 You can read more about Giesy in Under the Moons of Mars (1970), edited by Sam Moskowitz. Unfortunately, Moskowitz's biographical sketch, in which Giesy is identified as "James Ullrich Giesy," must be taken with a grain of salt. Also, there is a brief entry on Giesy in Ohio Authors and Their Books, 1796-1950 (1962), edited by William Coyle. (1) Starling Medical College is now part of Ohio State University. According to Sam Moskowitz, Giesy arrived with his family in Salt Lake City at age thirteen. He also served his medical internship in that city. (2) I'm not quite sure about Giesy's military career. According to public records, he served as a captain in the U.S. Army between August and December 1918. Sam Moskowitz wrote that Giesy organized an Army camp, Plattsburg Training Camp, in Salt Lake City in 1916, and that he served in the reserves as a major after the war. As for his civilian medical career, Giesy was editor of two journals, California and Western Medicine and Archives of Physical Therapy, X-Ray, and Radium. (3) By the way, J.U. Giesy (1877-1947) and Edgar Rice Burroughs (1875-1950) were very near contemporaries. 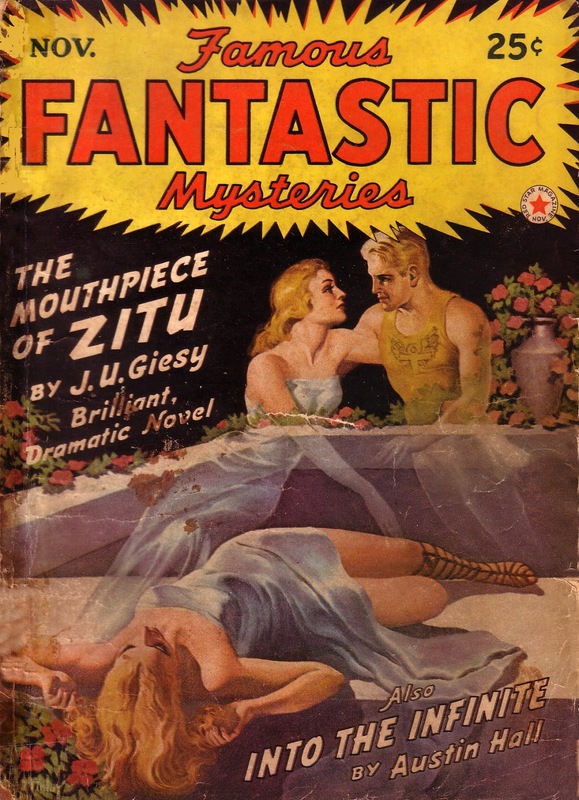 (4) Giesy, who wrote adventure, mystery, romance, science fantasy, and Westerns, also used the pen names Jay Ulrich and Charles Dustin. (5) By the way, the term "the yellow peril" was coined by Kaiser Wilhelm II. Writers of popular fiction quickly glommed onto the term for their own usage. Also by the way, gialli--literally, "yellows," named for their yellow covers--are an Italian genre encompassing crime fiction, thrillers, and what we might call weird terror or weird menace tales. And of course, The Yellow Kid and so-called "yellow journalism" date from about the same period as the first usage of the term "the yellow peril." So do yellow pencils, which have their own connection with what used to be called the Orient. So what is it with the color yellow? Coincidentally and inconsequentially, Richard Outcault, creator of The Yellow Kid, and William S. Giesy, father of J.U. Giesy, both hailed from Lancaster, Ohio. 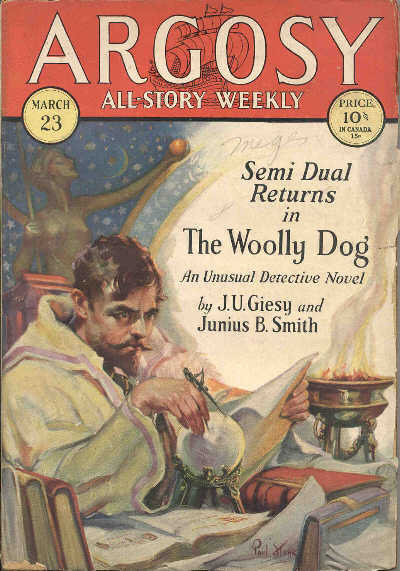 John Ulrich Giesy collaborated with Junius B. Smith on stories of Semi-Dual, an occult detective. 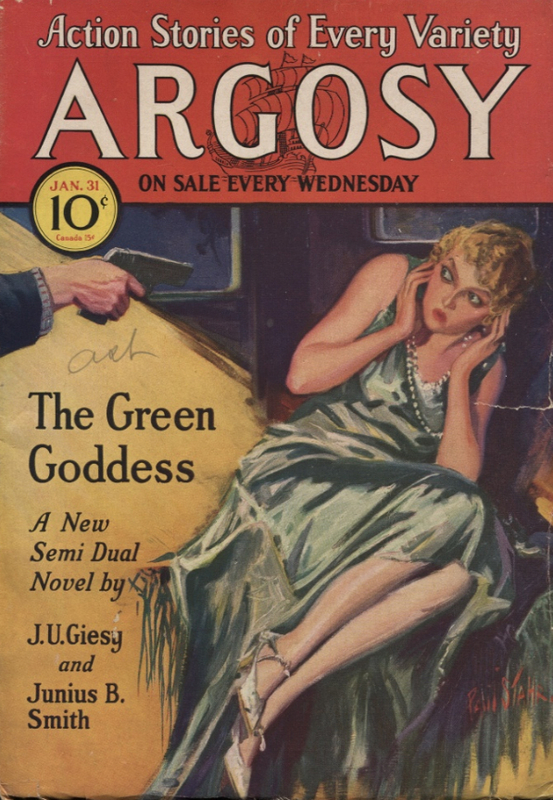 Here is a Semi-Dual cover for All-Story Weekly from nearly a century ago, August 25, 1917. It looks like the art is unsigned. 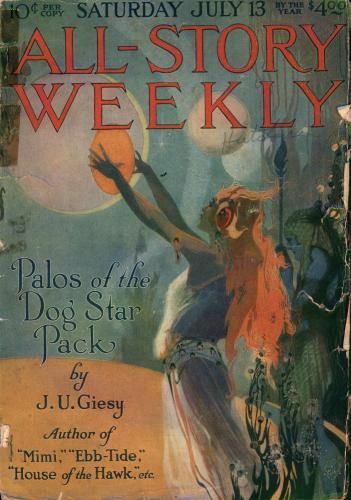 The following year (July 13, 1918), Giesy's scientific romance, "Palos of the Dog Star Pack," made the cover of the same magazine. The influence of Edgar Rice Burroughs seems obvious. 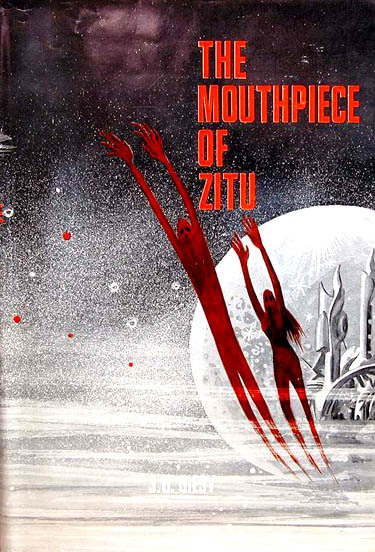 The sequel, "The Mouthpiece of Zitu," came along a year--almost to the day--later. The cover artist looks to be different than in the first installment, but I don't know the names of either. From top to bottom: 1) Another collaboration with Junius B. Smith from People's Favorite Magazine, Oct. 10, 1917. I can't read the artist's signature. 2-4) Three Semi-Dual covers from Argosy and Cavalier. 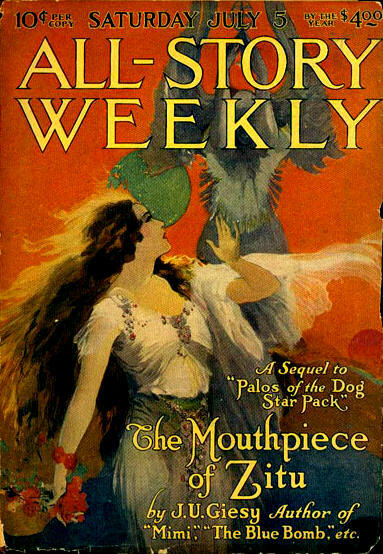 The first two covers are by Paul Stahr (1883-1953), a well known pulp illustrator. The work of J.U. Giesy got a first go-around in story magazines of the 1910s and '20s. Readers of science fiction and fantasy got a second look at Giesy's stories in Famous Fantastic Mysteries . . .
and Fantastic Novels (May 1948). 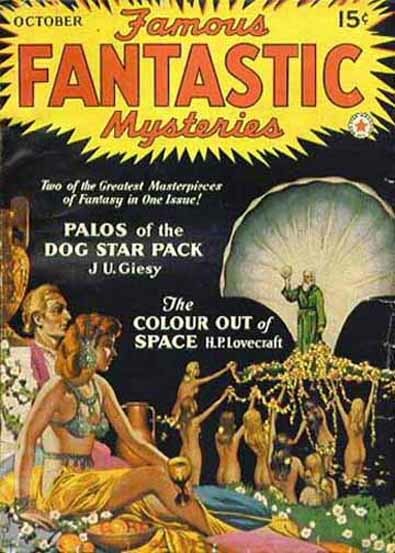 Here's another cover for Famous Fantastic Mysteries (Oct. 1941) in which Giesy shares cover space with H.P. Lovecraft but gets top billing and the cover story. If Lovecraft had written more stories with female characters, he might have received more space on pulp magazine covers. I don't know the artist on this cover, but it looks a little like Virgil Finlay. Likewise, I don't know the cover artists in the first two images. 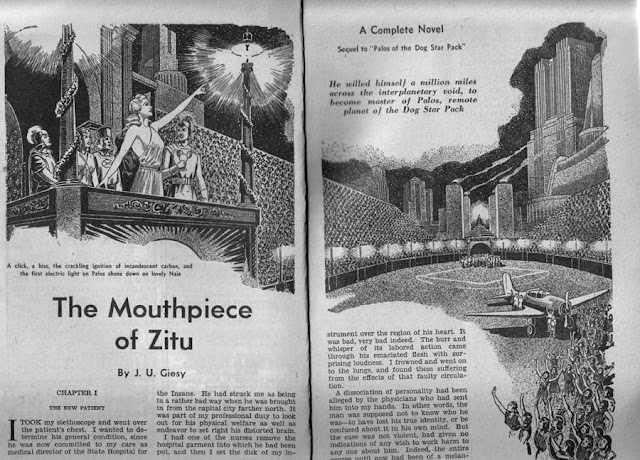 A nice two-page spread to open "The Mouthpiece of Zitu" from Famous Fantastic Mysteries, Nov. 1942. I don't see a signature or credit on the artwork. Giesy for a third generation of readers--these three covers are for hardbound editions of the mid-1960s. The cover artist was Gray Morrow.